ISLAMABAD, Sep 9 (APP): Prime Minister Muhammad Nawaz Sharif Friday said that his government would extend all out support to the Azad Jammu and Kashmir government to pursue its socio economic and infrastructure development agenda in AJK. 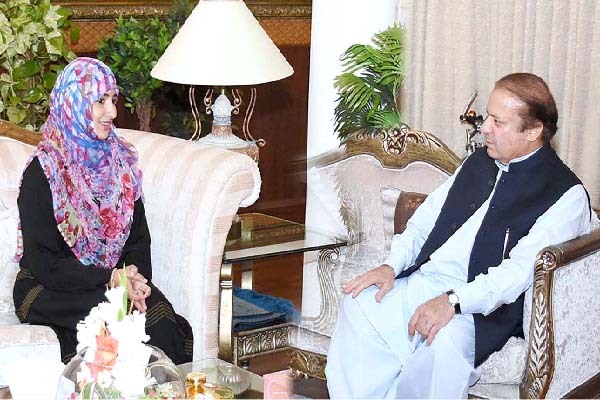 “The development projects and welfare schemes to be carried out in AJK will be of same standards as in other parts of the country, the prime minister said in a meeting with MLA AJK Legislative Assembly Sehrish Qamar who called on him at the PM House. He expressed the confidence that the newly elected MLAs under the leadership of Raja Farooq Haider would work tirelessly for the progress and prosperity of the AJK people. have overwhelmingly shown their trust in our manifesto during the recent elections, the prime minister stated. He congratulated Sehrish Qamar on being elected as MLA and expressed hope that she would spare no effort for emancipation of women. believe in their empowerment, protection and emancipation,” the prime minister remarked. Sehrish Qamar said that the AJK government was determined to realize the vision of Prime Minister Sharif for progress and prosperity of the AJK people. problems for quite a long time. She would work for educating them besides providing other necessary facilities so that they could contribute in the progress and development of AJK in a significant manner.